Bloating, though rarely serious, can be debilitating to a woman's self-confidence. Women can suffer from bloating during any stage of their life, but it becomes especially likely during times of hormonal imbalance, such as during menopause. However, there are things that you can do to reduce menopausal bloating, such as developing good day-to-day habits. 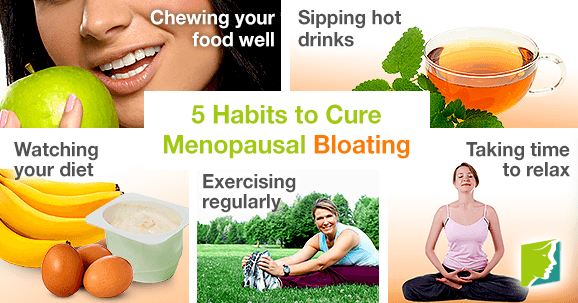 Continue reading to discover the best five habits to implement to cure menopausal bloating. This is the very first stage of digestion. Make sure your food is properly chewed so that your saliva can begin breaking it down quickly. This will aid your overall digestion and can help reduce menopausal bloating. The golden rule is to try to chew food at least 20 times before swallowing in order to create less work for your stomach and intestines, thereby reducing the chances of the food fermenting and producing gas, which can in turn lead to bloating. Drinking most hot beverages can help to relieve menopausal bloating. For example, drinking hot water before and after a meal can help aid digestion. In addition, choosing to drink chamomile or mint tea rather than caffeinated beverages can reduce bloating and relieve stomach pains. Try swapping your usual black tea or coffee for one of these alternatives. Take time to step back and review your diet to see if there's any improvements that could be made that would contribute to curing menopausal bloating. Try to avoid foods that are difficult to digest and are prone to causing bloating, such as cabbage, broccoli, soft cheese, onion, and milk. On the other hand, try consuming more foods that minimize gas, like bananas, eggs, and yogurt. Implementing a regular exercise regime will be beneficial for your overall health, and not just your menopausal bloating. Engaging in 30 to 40 minutes of physical activity every day will significantly reduce your risk of experiencing menopausal bloating, because it will keep your digestive system working efficiently while also enabling any blocked gases to pass through the digestive tract. Stress can contribute towards menopausal bloating by preventing the digestive system from working as it should. Practicing relaxation techniques, such as yoga, can help relieve menopausal bloating by encouraging blood supply to the digestive tract, helping it work more efficiently by breaking down food faster. Suffering from bloating during menopause is a common problem, but not one that women must simply put up with. Tackle bloating by introducing the five daily habits outlined above, all of which can help towards making a long-term and short-term difference to abdominal bloating caused by hormonal imbalances.For further information on how to manage this menopausal symptom follow the link below.